Confederate Ironclads - Casemate Ironclad Rams of the Confederate Navy. 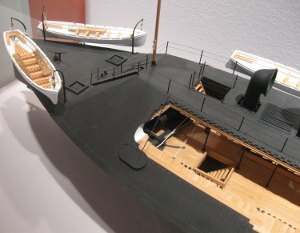 The Confederate ironclads were unique in many ways. After the early success of the CSS Virginia challenging the blockading Union fleet at Hampton Roads the concept as such had been proven a success. However, the Virginia was just a stepping stone - the Civil War ironclads had a long way to go still. One thing to remember is that the South, for most of the civil war, was severely limited in its access to metals and heavy manufacturing capabilities. 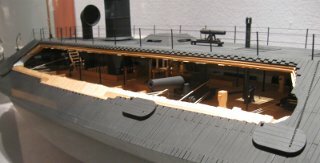 The design and construction of their ironclads reflect that. The Confederates had also realized that time was not on their side, so these ships had to be built fast. In order to do that they needed to be simplified in design without sacrificing any tactical advantage. A good example of a second generation Confederate ironclad, the CSS Richmond. 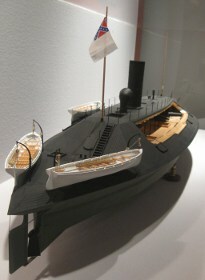 Model at the Hampton Roads Naval Museum. The reason the CSS Virginia had to be destroyed by her own crew was her deep draught at 22 feet, prevented them from bringing her further up James River into safety. This was an expensive lesson. Subsequent ironclads were designed with much shallower draught – rarely over 10 feet. This was a great help since they were pushed further and further up the various rivers by the Union. CSS Virginia's casemate (or shield) had rounded ends towards the stem and stern. The casemate was covered with two layers of two-inch iron bars. First (or bottom) layer horizontally and the second vertically. It must have been a daunting task to bend the bottom layer to take the rounded shape and fit well. Later ironclads had casemates with all flat panels – either six or eight facets. The CSS Virginia had a cast iron pilot house. Later ironclads had pilot houses constructed in the same manner as the casemate with the same wrought iron bar covering. Another view of the CSS Richmond. Note the pilot house on top of the casemate. Hampton Roads Naval Museum, VA. 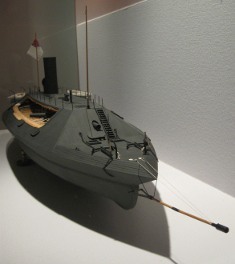 The hulls were either converted steam vessels or their hull shapes were made simpler – flat bottoms and hard chines. This aided in keeping the draught low and shortened the construction time. The first Confederate ironclad was the CSS Manassas. She was originally built as the icebreaker Enoch Train, in 1855. The ship was radically altered and ended up looking a lot like a turtle shell with a funnel in the middle. She was odd looking and only projected 2 1/2 feet above water. She was designed as a ram mainly with a single gun firing forward. Her armor consisted of 1 1/2 inches of iron plating. This was enough to have enemy cannon balls bouncing off with minimal damage. A rear view of the CSS Richmond. The angular shape is clearly visible. Hampton Roads Naval Museum, VA. The CSS Richmond was one of several second generation Confederate Ironclads designed by John L Porter. Richmond was a prime example of the "new" confederate ironclads. One unusual feature was the spar torpedo, never before implemented on an ironclad. 19. CSS Tennessee – Ironclad Ram 1864-1864, later USS Tennessee, 1864-1867. The only Southern Ironclad to be comissioned in the US Navy after the war. The CSS Virginia is sometimes mistaken as the first ironclad of the Confederate Navy, or the Civil War for that matter. She is also mistakenly referred to as Merrimack (sometimes without the 'k'). The truth is, she was converted from the burnt hulk of the US steam frigate, the USS Merrimack. The Virginia went berserk on the blockading Union navy vessels – all unarmored wooden sailing ships – on March 8, 1862. The next day she participated in the first ever engagement between ironclads at the battle of Hampton Roads, as she engaged the USS Monitor. With her radical design, the CSS Virginia was part of changing naval warfare for ever. Another view of the casemate of the CSS Richmond, Hampton Roads Naval Museum, VA.